In this article, I'll teach you several methods for using chakra tones to open, balance and align your chakras, using just the power of your own voice. Don't worry, you don't have to be a great singer, or even a good one. You just have to be able to make a noise. You probably don't need this explanation, but just in case you do, here's a quick summary. Chakras are energy centers, or portals in the human energy field. Located along the central channel of the body from the base of the spine to the top of the head, they are conceived of as whirling, wheel-like vortices through which universal/cosmic energy flows into and out of a person. There are seven major chakras, plus many minor ones. Each chakra corresponds to specific glands, organs, and facets of your being. Energy flows through the chakra system in two ways. First, it flows up and down along the central channel, connecting the chakras. Second, it flows horizontally, in an exchange of energy with the cosmos. Chakras can become blocked or imbalanced. This has a significant impact on the entire energy system. Vocal toning the chakras is a powerful way to help restore balance and flow to your chakra system. Music and sound in general have strong healing properties, but it is the human voice that carries the strongest healing power of any musical instrument. "Toning" is using the voice specifically as a healing instrument. It's not chanting or singing. In toning you create a drawn-out vowel sound or syllable. It's just a sound, rather than a word. To do it, you pick a note and hold it for a while, letting the vibration of the sound resonate in your body. Toning like this can help your body or your energy resonate at a healthy vibration, helping it get "back into tune." Your voice also powerfully carries your intentions. When you set your intention for healing, toning delivers that healing energy with great effectiveness. Using your voice to sound the chakra tones can help to restore balance and flow to the chakra system. Beyond being good for your health, vocal toning the chakras is also very enjoyable. It creates a vibration deep within the body that is very soothing. At the same time, it brings greater awareness of the body, both its physical and subtle aspects. It's one of my favorite ways to work with the energy of my chakras--I love the peaceful feeling that it gives me. And don't worry -- like I said, you don't have to know music, or have a "good" voice, to do it! This table gives some basics about the chakras and the two types of sounds associated with each. The first sound is the vowel, and the second is the "bija," or sacred sound, associated with the chakra. The "notes" are indicated in the "do re mi fa sol la ti" scale that nearly everyone is familiar with. *Chakra expert Anodea Judith uses different vowels as chakra tones. Starting with Chakra 1, they are: O as in home, U as in cool, A as in father, A as in hay, E as in feet, mm, and nng as in ring. Just silence can also be used for the seventh chakra. Use whatever works best for you. Let me repeat that you don't have to have a "great" voice or read music to do work with the chakra tones. Whatever your voice is, is perfect--especially for you! It makes so much sense to use the vibrations of your own voice--what medicine could be more perfectly suited to you? You don't have to be loud or strain your voice. Do whatever feels right to you, but nice and soft is just fine. Make yourself comfortable, sitting upright in a chair, comfortably but with your spine straight. Choose a place and a time where you will not be disturbed for 15 minutes or so. To tone, you can choose either the vowel sound, or the bija mantra shown in the chart. Start with the first, or root chakra, and work your way up. As you create each tone, first take a deep breath, all the way into your belly, then just let the sound flow from you as you exhale. For the 1st chakra, you'll tone "uh" or "lam." For the second, you'll tone "ooh" or "vam," and so on. Feel the vibration of each tone in the area of the chakra being toned. Gently hold the intention that it will open the chakra just the right amount, clearing any blockages or impurities; that it will balance the chakra with the other six chakras; and that it will align and energize each chakra. You can hold the color of the chakra you're toning in your mind's eye as you tone, as well. Sound each tone several times, say three to ten. The pitch of the toning should go up as you rise through the chakras, roughly following the notes of "do re mi fa so la ti." But don't sweat it if this makes you nervous; you can even just use the same note for each chakra if you want. Intention is the main thing! When you're done, give yourself some time to meditate or sit in silence for a few minutes. After your in-breath is complete, pause for a second or two before exhaling. If this makes you dizzy or faint, return to normal breathing for a while and try again later. If you don't have time for the longer version, simply do the same thing, but only repeat the tones once or twice. If at any time during your day, you feel that a particular chakra, or a particular aspect of your life, is "out of whack," just tone that chakra, or the chakra related to the aspect of your life you're having trouble with. For example, if you need to boost your confidence and personal power, tone the 3rd chakra. If you're having trouble expressing yourself, or having trouble with a creative project, tone the 5th chakra. And so on. Jonathan Goldman is a leading expert in sound healing. He has a number of good books and CDs. I have his "Vocal Toning The Chakras" CD and really like it. 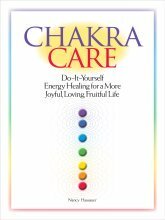 If you'd like lots more ideas for chakra opening and balancing, you may enjoy my book, Chakra Care: Do-It-Yourself Energy Healing for a More Joyful, Loving, Fruitful Life, which I created to help people understand the chakras and learn ways that anyone -- not just professional energy healers -- can balance, align and nurture them. This practical, highly readable resource has over 500 down-to-earth activities and exercises. It's a just-right explanation of the chakras for beginners, but it has loads of fresh ideas and perspectives for more experienced energy workers, too. Go from Chakra Tones to site home page .